I started today off with an early morning run to the boulangerie for pastries and pizza (lunch) and to an ATM - chambre d'hôtes do eat up cash faster than dormitories in gîtes.... and we're fine with that. We had breakfast with our little gîte group before we all went separate ways. The French Canadian couple were going to Lembeye to visit with a cousin for a few days, the Madagasgar couple were taking a side trip through Lourdes and our two French gentlemen, Jean-Claude and Jean-Marie were heading back into town before they continued on the route. Again today the walk was quite reasonable, a few undulations but no monumental climbs and we managed to detour most but not all of the mud. When I was manouevering through the mud, I remembered an incident from when my neighbours' grandaughter was about three years old and she fell in the mud and came out with a pretty descriptive expletive - probably picked up from her dad and all I could think as I was slip sliding through the muck was, "Dead on, Emma." It was another cloudy day but so far the threatening rain is holding off - waiting to make the weatherman look good? (Rain is forecast for a week starting Wednesday). A few interesting bridge crossings today. As I walked along today I was thinking about the different frame of mind I've had for each of our three Caminos. The first one, the Camino Frances in the Spring of 2009, was taken after two years of obsessive planning. Throughout that pilgrimage, even with 600 kms of tendinitis, there was always a feeling of excitement, disbelief and wonder, "Wow, I am really doing this!" 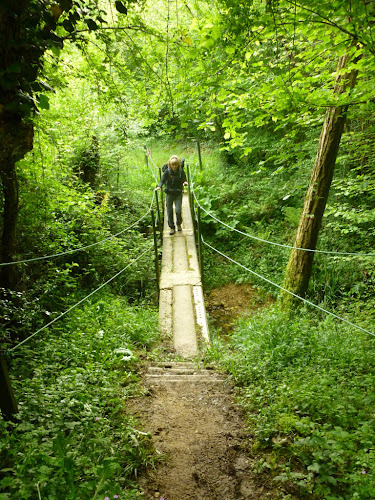 On the second Camino, the Chemin Le Puy, the mindset was a calmer confidence, "I've done this. I know what to expect." With this third Camino, the Chemin d'Arles, it has taken me longer to 'get into' it. My mindset has been one of dogged resignation or even resistance, "Well, I'm here. There's nothing to be done but get at it and KSO, keep straight on." Today, day 23 of walking, I think I have finally accepted this Camino. I am done walking today and I am ready to walk tomorrow. So far we have walked 574km with another 300 kms before we reach Puente la Reina in Spain. After that it is on to Santiago and maybe the Camino Muxia/Finisterre. Our gîte La Collinière is a perfect little oasis, a carriage house next to the main house, with a huge garden, and, best of all, the entire gîte to ourselves, not that I'm anti-social but it's nice to have some privacy for washing, showering, sleeping etc. Our demi-pensionne meal was delivered to the carriage house gîte; a huge plate of grated carrots, tomatoes, beets and artichoke hearts all in a tangy vinaigrette dressing plus bread, wine and pâté and smoked salmon for Dayton. The main course was delivered next, roasted diced potatoes (almost French Fries!) garlic stuffed and pesto topped roasted zucchini and a couple of pork chops for Dayton. This was followed by an apple pie tart which, too full to eat, I am saving for breakfast. 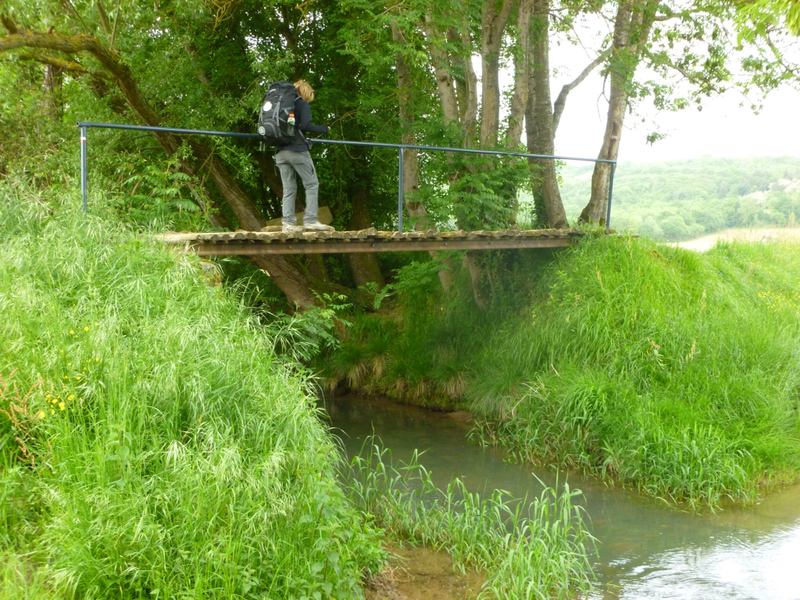 So great to read your blog again, and we're glad you're having a great camino!